The 113-pages book (ISBN 978-0976511632) was published by Copperhill Technologies Corporation. It gives an introduction into the SAE J1939, which is a CAN-based higher-layer protocol. It has become the accepted industry standard for off-highway machines in applications such as construction, material handling, and forestry machines. J1939 provides serial data communications between electronic control units (ECU) in any kind of heavy-duty vehicles. The messages exchanged between the ECUS may be such data as vehicle road speed, torque control message from the transmission to the engine, oil temperature, and further. 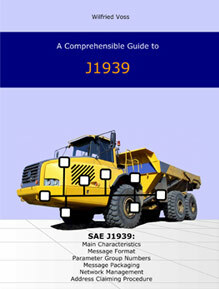 The information in this book is based on two parts of the SAE J1939 standards collection: J1939-21 (data link layer) and J1939-81 (network management). The book is also available as an E-book (PDF) from the publishing house.